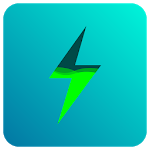 iBattery Saver is a new multifunctional app for Android devices. It is designed for optimization of the performance of your device. This app differs from analogues by simplicity and convenient interface and multifunctionality. Let's talk in more detail about each of them. When you open the app, a very convenient interface opens. You can make an instant search and fix challenges with power consumption. You can set the mode that corresponds to the use of battery. With this function, you have the opportunity to scan your Android device to find out which apps use the most battery, after which you can complete these processes. This will give you a few extra minutes of smartphone’s operation. Battery Saver in real time shows the exact charging time and remaining battery operation time. 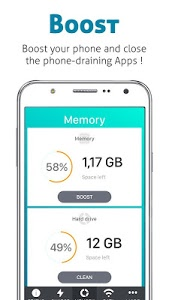 The first one not only helps to free up space in the memory of your smartphone, but also makes your device more productive. With our professional Cleaner you can also free up even more memory, by removing cached data from social networking applications such as Facebook, Messenger, WhatsApp, Instagram and others and don’t worry about accidentally deleting the wrong files. Cache Cleaner helps you to delete cache and residual files easily and with one click. On android devices cache and residual files usually accumulate about hundreds of megabytes. Now Cache Cleaner will perfectly clean your cache and remove the remaining files and junk, thereby optimizing the performance of your device. The App Manager consists of removal and backup assistants. Also this application contains CPU Cooler. Our app regularly detects monitors and disables apps that heavily load the processor to secure your smartphone. 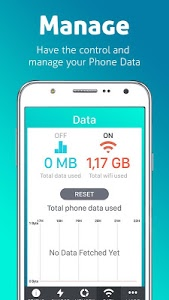 Thanks to the new Data function, you have the ability to reduce data usage and optimize your device to the maximum. The application monitors the use of mobile, roaming and WI-FI data. In our epoch of advanced technologies, and given that now a person spends a lot of time on his device it is very important to properly monitor the use of data and optimize their usage. Well, in the end, we will describe a few more advantages of the application. Battery Saver is a very convenient and simple application. There are no extra items in the application menu. 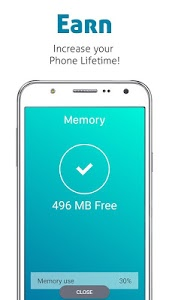 The interface of the application is thought up to the smallest detail: even a very unexperienced Android user can easily use all the advantages of Battery Saver. In the epoch of information technology and the Internet, it is very important to stay connected. Therefore, any smartphone owner needs to keep his device in charge for as long as possible, because it is not possible always stay near charging. Using the Battery Saver application, you can not only optimize battery power, but also clean the device of unnecessary junk files. Convenient interface, modern design and ease of use all this makes this application the best solution for optimizing your device. 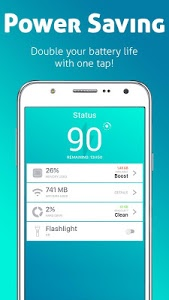 Similar to "iBattery Saver - Boost & Clean"